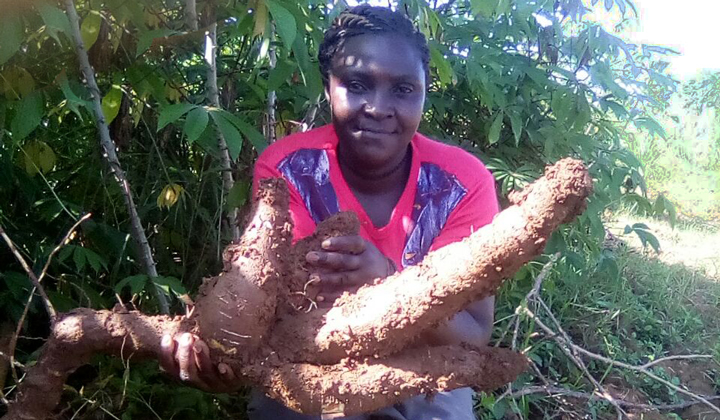 Cassava farmers in Dokomi Village in Busia Sub-county, Kenya are reaping the benefits of their produce thanks to TruTrade’s market linkage service. Mildred Achieng, a mother of two is one such farmer. “I have been able to rent a piece of land and expand my cassava plantation,” says Mildred. Lack of readily available markets means that many farmers like Mildred have been planting cassava as a source of family food. Until recently Mildred has been selling her cassava to her neighbours, many of whom are also cassava farmers. “I would not make any money from selling my cassava, so we would eat most of it,” she says. John Ken Okudoi one of the TruTrade agents in the area and a member of Tangakona Cooperative Society says that perceptions that cassava farming is only a subsistence crop are slowly changing as we continue to provide ready market for the farmers. TruTrade CEO Jenny Rafanomezana says that the company is committed to provide a marketing service to thousands of farmers like Mildred in Kenya and Uganda, to enable them to meet the growing demand for the product. “Cassava is a drought tolerant crop that can play an important role in smallholder farmer livelihoods. It requires little care and can be harvested throughout the year,” she says. “However, the industry across the region is still at cottage level making productivity low while the cost of production is still high and processing facilities are limited. TruTrade is helping farmer business groups, entrepreneurs and cooperatives to build a business case to get investments for processing facilities. “In the last six months we have supplied 15 tonnes of dried and chipped cassava chips to a premium market. We are targeting to source 230 tonnes of raw tubers in 2018” adds Jenny.